A typical baseball cap; this one is an Oakland Athletics cap. A baseball cap is a type of soft cap with a rounded crown and a stiff peak projecting in front. The front of the cap typically contains designs or logos of sports teams (namely baseball teams, or names of relevant companies, when used as a commercial marketing technique). The back of the cap may be "fitted" to the wearer's head size or it may have a plastic, Velcro, or elastic adjuster so that it can be quickly adjusted to fit different wearers. The baseball cap is a part of the traditional baseball uniform worn by players, with the brim pointing forward to shield the eyes from the sun. The cap is often seen in everyday casual wear. 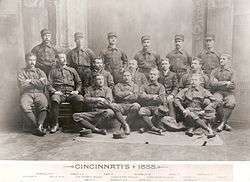 Portrait of Cincinnati Reds players, 1888. In 1860, the Brooklyn Excelsiors wore the ancestor of the modern rounded-top baseball cap, which featured a long peak and a button on top, and by 1900, the "Brooklyn style" cap became popular. During the 1940s, latex rubber became the stiffening material inside the hat and the modern baseball cap was born. The peak, also known in certain areas as the "bill" or "brim", was designed to protect a player's eyes from the sun. Typically, the peak was much shorter in the earlier days of the baseball hat. Also, the hat has become more structured, versus the overall "floppy" cap of the 19th and early 20th centuries. The baseball cap was and still is an important means by which to identify a team. Often the logo, mascot, or team's initial was placed on the cap. Usually, the cap was also fashioned in the official colors of a particular team. The basic shape, including curved peak, is similar to some styles of 19th century sun bonnets. Fitted baseball caps, those without an adjuster, are normally sewn in six sections, and may be topped with a matching fabric-covered button (also called a squatchee) on the crown. Metal grommets or fabric eyelets are often sewn or attached near the top of each of the six sections of fabric to provide ventilation. In some cases, the rear sections of the crown are made of net-like mesh material for extra ventilation. The peak is typically stiffened by a sewn-in piece of paperboard or stiff plastic. Baseball caps are made of many types of material and shaped in various styles for different purposes. Major and minor league baseball players wear classic-style caps made of wool (or, more recently, polyester) with their team's simple logo and colors; the logo is usually embroidered into the fabric. Formerly, baseball caps only came in standard hat sizes. Since 1980, they have also been available in a one-size-fits-all form, with an adjustment strap in the back. The style, commonly called snapback, has become increasingly popular as fashion accessories. Advances in textiles have led to the "stretch-fit" hat, which uses Lycra or rubber to allow a hat to have a fitted style while still being "adjustable" within sizes. Another version of the baseball cap is a plastic mesh cap with a foam front imprinted with a company logo. 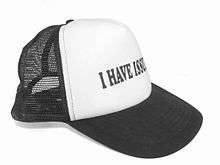 This style of baseball cap is sometimes called a trucker cap or a "gimme cap" because it is given away for free as a promotional item. In baseball, caps are worn backwards to accommodate for a face mask by some catchers and are worn under the mask of umpires. Beginning with the 2014 season, MLB pitchers are permitted to wear a special reinforced cap to protect their heads from line drives. Athletes in other sports wear caps with their team's logo and colors as "sideline" caps; both types are also sold as authentic team merchandise in retail stores and are quite popular. Other caps may simply have a company's logo, such as Reebok, Nike or Carhartt; these hats are often made of brushed cotton. Golfers tend to prefer the visor form of cap which does not cover the head but keeps the sun out of their eyes; women also traditionally have worn visors casually but a trend towards certain youth subcultures see an increase in visor popularity among both sexes. Baseball caps worn by naval officers from the US, Singapore, Thailand, Brunei, Indonesia, Malaysia, and the Philippines. Some armed forces also use baseball caps as part of their uniforms, including the United States Navy and United States Coast Guard. Used mostly with the utility uniform and coveralls, the baseball cap usually has a command logo on the front to denote command affiliation. Also baseball caps of a particular color are worn to denote a specific function of a person or particular job. 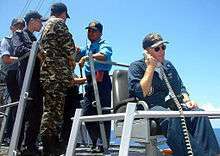 Two examples are in the United States submarine force, red baseball caps are worn by drill monitors who facilitate and critique members of the boat's crew during drills. Also in the United States Army, parachute riggers wear red baseball caps and parachute instructors wear black baseball caps as part of their uniform. In various squadrons of the United States Air Force's civilian auxiliary, squadron-distinctive baseball caps have been issued as headgear (or "cover") for the Battle Dress Uniform, typically displaying squadron colors, squadron number, and/or squadron patch. Though the BDUs have their own cover, a patrol cap in M81 Woodland, some squadrons have opted for more distinctive covers. In many United States police forces, the baseball cap is worn as a more practical alternative to the traditional peaked cap or campaign hat, the latter of which is generally used by Sheriff's departments and state police forces. This is more true on the West Coast, whereas in eastern states the traditional peaked cap is more prominent. A notable exception is the San Francisco Police Department, where peaked caps are still worn regularly. In Slovenia, policemen on motorcycles wear baseball caps as a part of their uniform, when they remove the helmet. The baseball cap is also commonly used by private security companies as a cheap, practical piece of uniform headgear. There has been a marked trend in recent years amongst police forces and other uniformed bodies throughout the world to substitute the cheap and comfortable baseball cap for peaked caps and other traditional headdresses. Many armed police units around the world, notably SWAT in the United States and Metropolitan Police's Specialist Firearms Command in the United Kingdom, often wear baseball caps to shield their eyes from the sun where a full helmet would be excessive. ↑ "Baseball cap has endured generations as the all-American hat". Retrieved 2014-04-26. ↑ "Mens Fashion Trend: Snapback Caps". Retrieved 2014-04-26. ↑ "MLB approves protective cap for pitchers in time for 2014 season". Retrieved 2014-04-26. Wikimedia Commons has media related to Baseball caps.